Australian Pump Industries presents a new submersible pump from Tsurumi to work in applications involving the temporary bypass of sewage during sewer reconstruction work. Tsurumi’s KRSU series 8” submersible pumps offer a maximum head of 26.5m and a maximum flow of 5,700 lpm. The slim design enables it to fit into a standard manhole. Aussie Pumps’ Tsurumi Divisional Manager, Neil Bennett explains that the pump’s unique 546mm diameter allows it to operate in the deep, confined spaces of a conventional manhole. Sewer pipes need to be replaced when they deteriorate with age or are damaged during nearby construction or earthworks. During repairs and replacement of these pipes, the sewage must be safely diverted to prevent health issues for workers as well as the neighbouring community. 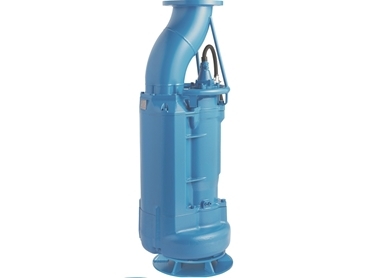 Key features of Tsurumi’s KRSU series 8” submersible pumps include semi-vortex impeller and large 56mm solids passage preventing clogging of foreign matter; top mounted discharge and side flow design ensuring efficient motor cooling, even when operating at low water levels; heavy-duty 22kW, 3-phase DOL dry-type induction motor; 4-pole motor, running at 1450 rpm, providing loads of torque and allowing for long, trouble-free life; and Tsurumi’s unique anti-wicking block for the cable entry. This watertight cable entry with strain-relief device prevents water incursion due to capillary action in the event of the power cable being damaged or the end submerged. Tsurumi protects the motor against water incursion from the pump chamber with their unique dual double-silicon carbide mechanical seals. These seals are located in an oil chamber away from abrasive particle pumped media. Additionally, a patented oil lifter in the oil chamber forcibly supplies lubricating oil to the seal surfaces. A motor protection device in the form of a circle thermal protector is built into the motor housing. It cuts power to the motor circuit if excessive heat builds up or an over-current condition occurs. Australian Pump expects the submersible pump to replace engine drive sewer bypass pumps, because of its ability to lift sewage from a depth of 25m.